A total shoulder replacement (TSR) is a surgical procedure that entails replacing the articulating surfaces of the shoulder joint in order to decrease pain and regain function. This is performed for people who have a debilitating chronic pathology or have suffered a severe trauma. A TSR has similar components as a total hip replacement. A TSR involves removing the humeral head and the glenoid surface and replacing them with artificial implants. This procedure is used after conservative measures have failed to control pain and improve shoulder function. The shoulder creates a ball and socket joint between the head of the humerus and glenoid cavity on the lateral aspect of the scapula. The articulating surfaces are covered in a hyaline cartilage which facilitates the bones gliding over each other. The joint is surrounded by a joint capsule and supporting ligaments, which are affected during the surgery and described below. The rotator cuff muscles consist of four muscles that lie close to the joint. They are responsible for the dynamic stability of the glenohumeral (GH) joint, and they assist in abducting and laterally and medially rotating the arm. 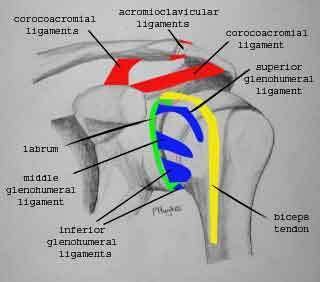 The rotator cuff muscles (see pictures above) include the supraspinatus superior to the spine of the scapula, the infraspinatus along the inferior aspect of the spine of the scapula, the teres minor assisting with lateral rotation of the arm at the glenohumeral joint, and the subscapularis covering the underside of the scapula. The pectoralis major and minor muscles lie anterior to the shoulder and assist in flexion, medial rotation, and adduction of the GH joint. 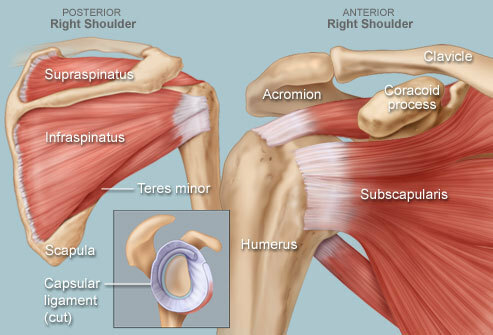 The deltoid muscle is divided into three parts (anterior, middle, posterior) which surround the shoulder and aid with abduction, extension, and flexion of the arm. - Located between the greater and lesser tubercles holding the long head of the biceps brachii tendon into the intertubercular sulcus. A total shoulder replacement is an option for patients with uncontrolled shoulder pain and functional limitations, when conservative options do not provide improvements or pain relief. Undergoing a TSR is a case by case decision made between the patient and physician. The patients who most often have TSR are those who have primary arthritis (osteoarthritis and rheumatoid arthritis), secondary arthritis (post-traumatic arthritis), inflammatory arthropathies, and osteonecrosis with an affected glenoid. Contraindications to a patient receiving a TSR include: acute infection, Charcot’s arthropathy, or destruction to the deltoid or rotator cuff musculature. Three main types of shoulder arthroplasty exist: hemiarthroplasty, total shoulder replacement, and reverse shoulder replacement. A total shoulder replacement is preferentially performed over a hemiarthroplasty when the glenoid’s integrity has been affected along with the humeral head. One should be aware that shoulder arthroplasty is best used for pain relief and to improve overall function, but full range into shoulder flexion and abduction may not be achieved. The table below from Kent and Johnson describes the type of arthroplasty most often indicated for specific conditions. In 2002, there was 23,100 total shoulder replacement surgeries performed. In the same year there were 343,000 total hip replacements and 400,000 total knee replacements performed. While TSR represents but a small fraction of joint replacements, the number of TSR surgeries is expected to increase over time. A number of different predisposing pathologies can lead to the need for a total shoulder replacement. The primary causes are osteoarthritis and rheumatoid arthritis. Arthritis is the leading cause for TSRs because the joint surfaces have deteriorated causing increased stress on the joint. Other causes for joint dysfunction include inflammation, injury, or previous surgery. No matter the etiology, when the joint’s cartilage is worn down, the shoulder does not glide and roll in a normal fluid motion, resulting in pain, stiffness, and loss of function for the patient. Other pathologies that can lead to getting a TSR are avascular necrosis, severe humeral fracture, dislocation arthropathy, or capsulorrhaphy arthropathy. In these cases the articulating humeral head and/or the glenoid fossa have been affected. Previous treatment options have typically been pursued prior to consideration of TSR for this patient population. Patients presenting status-post a total shoulder replacement will most likely bring their surgeon’s specific treatment protocol and limitations with them. During evaluation the physical therapist should assess that the incision site is healing appropriately, capture the patient's pain level, and gently measure the passive ROM of the surgical shoulder. Additionally, the physical therapist should measure the strength and ROM of the nonsurgical arm as a means of comparison. Patients typically seek conservative (vs. surgical) means first to address their shoulder pathology. Conservative treatment for glenohumoral arthritis includes activity modification, nonnarcotic medications to reduce pain, home flexibility and strengthening programs, and general conditioning. Activity modification includes avoiding activities that load the joint such as racquet sports and heavy weight lifting. The primary goal is to limit aggravations to the shoulder while strengthening and maintaining flexibility. For those who are unwilling to modify their recreational activities surgical correction may be ideal. Patients undergoing a TSR are placed under general anesthesia as well as regional anesthesia, which can extend postoperative pain control. The patient is then placed in a beach-chair position, with the back at approximately 30 degrees and the operative arm and shoulder completely off the edge of the table. Once placed into this position, passive shoulder range of motion will be noted by the surgeon. The incision site is then marked and usually extends from the coracoid process to the deltoid insertion. This is roughly 10-15 cm in length. The arm can be supported in many ways, but typically a mechanical arm holding device is used. A standard deltopectoral approach is used for the majority of primary TSR’s. The surgeon makes the deltopectoral skin incision and identifies the location of the cephalic vein. Next, the underlying clavipectoral fascia and conjoined tendon must be exposed. The subscapularis tendon is exposed next and the upper border of the pectoralis major tendon can be released if additional exposure to this area is needed. The bicipital groove and long head of the biceps tendon are identified next. The biceps tendon sheath is opened and a biceps tenodesis is performed. After tenodesis, the tendon is cut and removed. To expose the glenohumeral joint, the subscapularis tendon is released. Retractors are used to maintain exposure to these areas. The joint capsule is released, and then humeral head is dislocated by adduction, external rotation, and extension of the arm. The humeral neck cut is made proximally to the rotator cuff insertions, without disturbing these insertions. Proper arm positioning, adequate humeral neck cut, retractor placement, and soft tissue releases all contribute to glenoid exposure. 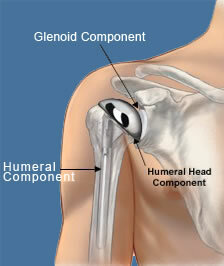 The glenoid can be sized and marked after removal of the labrum. A center and three peripheral peg holes are drilled into the glenoid. The glenoid is then irrigated and dried. The peg holes are also packed before cementing for hemostasis. A reamer is used to enter and open up the intramedullary canal. Trial heads are used to find the appropriate size of the cut humeral head. After selecting the properly sized humeral head, the trial is exchanged for the final humeral prosthesis. Patients either receive an uncemented, press-fit stem or have the humeral prosthesis cemented into place. Finally, the incision site is irrigated before closing the tissue. The patient’s arm is placed in a standard sling. Radiographs are taken soon after to assess the surgical area. More detailed, precise steps are available on the video and on the links below. Total shoulder replacement surgery offers a good prognosis. Most patients experience a decrease in pain, stiffness, improved motion and strength, enhanced function, and overall better quality of life after their procedure. Just like any other surgery, total shoulder replacement comes with potential post operative complications. The most common are prosthetic loosening, glenohumeral instability, periprosthetic fracture, rotator cuff tears, infection, and neural injury. The most common complication is component loosening, which usually requires a revision. A study in the Journal of Shoulder and Elbow Surgery reported a 5 year survival rate is 100% and the 10 year survival rate is 92% for TSA. Instability is only estimated to be found in 5% of cases. It is usually caused by a combination of poor component position and soft-tissue imbalance. Periprosthetic fracture may happen intraoperatively or postoperatively. Intraoperative fractures most commonly occur in patients with rheumatoid arthritis and usually happen when the humerus is rotated for exposure. Postoperative rotator cuff tears have been associated with multiple surgeries, overstuffing of the joint, overly aggressive therapy involving external rotation during early stages of rehabilitation, and tendon compromise by lengthening techniques. The prevalence of neural injury and infection have both been shown to be very low (<1%). Of nerve injuries noted, most occur to the axillary nerve and the majority spontaneously resolve over time. Infections usually occur in individuals who are immunosuppressed. Although rare, infection can be very devastating. TSAs have been associated with less mortality and morbidity than THAs and TKAs. There seems to be no additional concern of post-op complications among the elderly population compared to younger populations, as one study showed no difference in complications between patients greater than 80 years of age and patients less than 70 years of age. The only difference noted was that the older patients may require longer institutional care before returning home. There are many rehabilitation protocols for post-TSA rehabilitation and they all follow similar progressions. Generally rehabilitation begins with gentle passive range of motion with external rotation limitations early on, cryotherapy, scapular isometric exercises, and eventual progression to active assisted range of motion. The following stages progress from early strengthening and range of motion, to neuromuscular control, and finally functional activities. The goal of rehabilitation is to optimize patient performance in each area of treatment noted above. There is no standardized protocol that is supported by the literature, but all protocols seem to follow a similar progression. Slight differences between protocols include the amount of external rotation limited (examples: avoid 30 degrees, 20 degrees, or excessive/sudden movement), the time frame for each stage progression, and the total rehabilitation time (examples: 12 weeks+, 16-24, or 24+). The differences are based on the physicians preferences and how the surgical procedure was performed. While minor differences behind the protocols exist, the goals for TSR rehabilitation (full range of motion, strength, neuromuscular control, and function) remain the same. The Brigham and Women’s Hospital provides one detailed example of a post-operative rehabilitation protocol for total shoulder replacements. It includes phases of treatment, limitations and permitted movements. Many outcome measures exist for shoulder function. The ones listed below have been commonly used and validated (with the exception of the UCLA Shoulder Score) in patients with total shoulder replacement. The ASES Shoulder Outcome Score is a 10 item questionnaire that is scored from 0-100 based on pain, instability, and ADLs. This portion of the test takes 3-5 minutes to administer and 2 minutes to score. The test also includes sections of objective data to be taken by the examiner that are not included in the score. It has been validated in patients aged 20-81 years. The minimal clinically important difference (MCID) is 6.4 and the minimal detectable change (MDC) is 9.7. The Constant Shoulder Score is scored from 0-100 based on pain, ADLs, ROM, and power. It is appropriate for patients aged 14-85 years. Administration takes 10-15 minutes and scoring takes 2 minutes. The DASH is a 30 item questionnaire that is scored from 100 to 0 based on physical function, symptoms, and social function. It is recommended for patients aged 18-65 years. Administration takes 5-7 minutes and scoring takes 3 minutes. The MCID is 10.2 and the MDC is 12. While the UCLA Shoulder Rating Scale has not been validated in patients with total shoulder replacement, it was originally developed for this patient population. It is scored from 0-35 based on pain, function, forward flexion, forward flexion strength, and overall satisfaction. 1. Matsen F, Warme W. Total shoulder joint replacement for shoulder arthritis: Surgery with a dependable, time-tested conservative prosthesis and accelerated rehabilitation can lessen pain and improve function in shoulders with arthritis. http://www.orthop.washington.edu/Portals/21/www/Patient%20Care/Our%20Services/Shoulder%20&%20Elbow/Articles/PDFs/Total%20shoulder%20joint%20replacement%20for%20shoulder%20arthritis.pdf. Updated March 26, 2011. Accessed November 26, 2011. 2. Grana W. American Academy of Orthopedic Surgeons. http://orthoinfo.aaos.org/topic.cfm?topic=A00094 Updated: October 2007. Accessed: November 26, 2011. 3. Deuschle J, Romeo A. 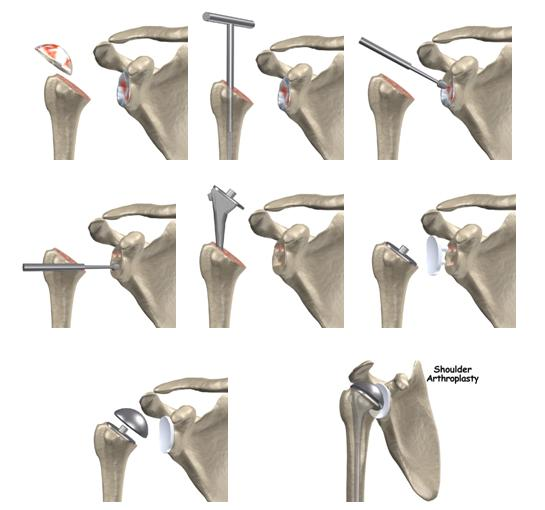 Understanding shoulder arthroplasty. Ortho Nursing. 1998; 17(5): 7-15. 4. Drake R, Vogl A, Mitchell A. Upper limb. Gray’s Anatomy for Students 2nd ed. Philadelphia, PA: Churchill Livingstone Elsevier; 2010: 670-671. 5. Sanchez-Sotelo J. Total shoulder arthroplasty. Orthop. J. 2011; 5: 106-114. http://www.ncbi.nlm.nih.gov/pmc/articles/PMC3093753/ Accessed November 27, 2011. 6. Kent W, Johnson L. Shoulder arthroplasty: pioneers, choices, and controversy. WebCentralORTHOPEDICS. 2011; 2(6): http://www.webmedcentral.com/article_view/1981 Accessed: November 26, 2011. 7. Funk L. Shoulderdoc.co.uk. http://www.shoulderdoc.co.uk/article.asp?section=875 Updated November 11, 2011. Accessed November 26, 2011. 8. Parsons IM, Buoncristiani AM, Donion S, Campbell B, Smith KL, Matsen FA. The effect of total shoulder arthroplasty on self-assessed deficits in shoulder function in patients with capsulorrhaphy arthropathy. J Shoulder elbow surg. 2007; 16(3): 19-26. 9. Parsons IM, Weldon EJ, Titelman RM, Smith KL. 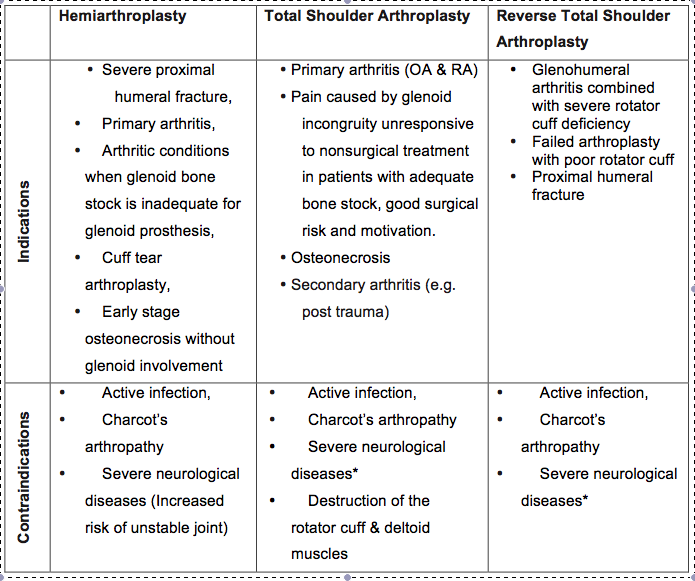 Glenohumeral Arthritis and its Management. Phys Med Rehabil Clin Am. 2004; 15(2): 447-74. 13. Fehringer EV, Mikuls TR, Michaud KD, Henderson WG, O’Dell JR. Shoulder arthroplasties have fewer complications than hip or knee arthroplasties in US veterans. Clin Orthop Relat Res. 2010;468(3):717-22. 14. Bartelt RR, Sperling JWJ, Schleck CDC, Cofield RHR. Shoulder arthroplasty in patients aged fifty-five years or younger with osteoarthritis. Journal of shoulder and elbow surgery / American Shoulder and Elbow Surgeons … [et al.]. 2011;20(1):123-130. 16. Wilcox R. The Brigham and Women’s Hospital, Inc. http://www.gamradtortho.com/forms/PostoperativePT/shoulder-postop/shoulder-replacement/Total-Shoulder-Arthroplasty-Protocol.pdf Updated: November 2006. Accessed: November 26, 2011. 17. Beth Isreal Deaconess Medical Center. Total shoulder arthroplasty rehabilitation protocol. http://www.bidmc.org/CentersandDepartments/Departments/OrthopaedicSurgery/ServicesandPrograms/SportsMedicine/ForPatients/~/media/Files/CentersandDepartments/Orthopaedic/Sports%20Medicine/Rehab%20Protocols/Shoulder%20Arthroplasty%20protocol.ashx Published 2012. Accessed: March 7, 2012. 18. The Case Shoulder $ Elbow Service. 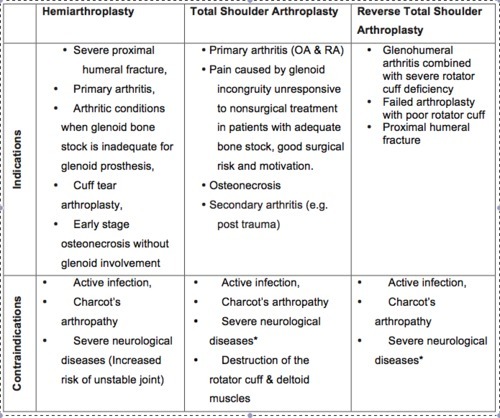 Total shoulder Arthroplasty/Hemiarthroplasty protocol. http://www.clevelandshoulder.com/pdf/tsaRehabInstructions.pdf Published 2012. Accessed: April 10, 2012. 19. Wright RW, Baumgarten KM. Shoulder Outcomes Measures. J Am Acad Orthop Surg. 2010;18:436-444.